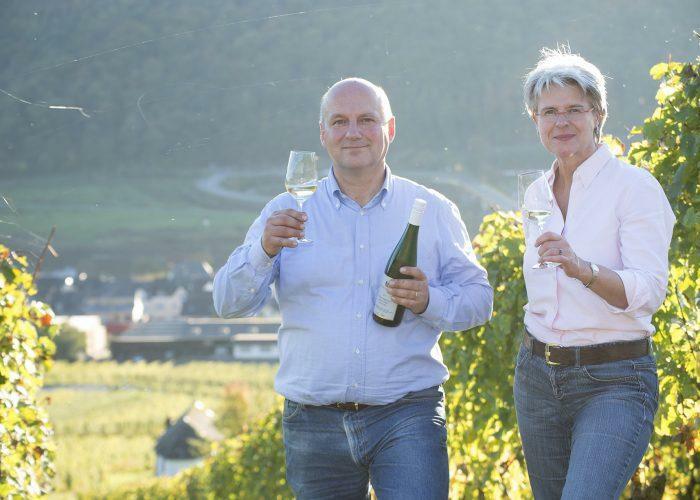 Today, Johannes Selbach and his wife Barbara, with the increasing help of son Sebastian, manage their vineyards and winery with passion and respect for the estate's long held traditions. 50% of their 21 hectares of vines are on their original rootstocks, in Zeltinger Himmelreich, Schlossberg, and Sonnenuhr; Wehlener Sonnenuhr; and, Graacher Himmelreich and Domprobst. These vineyards of weathered Devonian slate are on a steep, contiguous slope facing south-south west and represent some of the most prestigious sites in all of the Middle Mosel. The Selbach family's heritage in the wine business dates to 1660: Selbach's ancestors shipped wines down the Mosel in their own ships, the wine carried in oak barrels made by cooper Matthias Oster, the great-grandfather on the paternal side of the family. Thus, the winery developed as both a top estate producing some of the region's best wine, and also as a négociant and brokerage firm, consolidating the production of smaller growers. Johannes, like his late father Hans, has continued the use of traditional oak fuder in his cellar, bringing in new large casks every few years. Vinification is carried out in a combination of fuder and stainless steel, in an hands-off manner with no fining, and predominantly with wild yeasts. The focus is on meticulous work in the vineyard with the aim to produce and bring home perfect fruit. "Selbach aims for a typical modern Mosel style, which reflects the minerality of the rocky Devonian slate soils, as well as the elegance and finesse of the Riesling fruit in clear, crisp, elegant, low-alcohol, yet full-flavored handcrafted wines," says Stephan Reinhardt, in The Finest Wines of Germany. The hallmark of the estate are 3 old parcels that Selbach-Oster harvests en-bloc; or, as single pickings, with no selections pulled from the vineyard prior to harvesting. The Rotlay (in the Zeltingen Sonnenuhr, rich in iron ore), the Schmitt (in the Zeltingen Schlossberg), and the Anrecht (in the Zeltingen Himmelreich) are all old parcels high on their respective slopes and post trained on their original rootstock. Typically, Auslese is selected by successive passes through the vineyard--picking fruit for Kabinett and Spätlese first and leaving the healthiest berries on the vine to concentrate. For the en-bloc wines selection of this type is avoided, in order to maintain a holistic flavor profile that contains that of ultra-ripe grapes, optimally ripe, and of lesser-ripe ones which has the ability to reflect a complete terroir of both place and moment. Because his approach in winemaking is minimal, Johannes Selbach will allow his wines to ferment naturally, as slow or as complete as manifest, resulting in dry wines in some vintages and fruity in others.